A passenger entered a Haverhill-bound train at North Station in April. Finally, finally, finally the State House debate on a transportation funding law is over — at least for this year — and it’s pretty clear that most normal people never want to hear the words “transportation finance” again. After a whole lot of drama between legislators and Governor Deval Patrick, the House and Senate passed a bill that raises taxes, places a slew of demands on the Department of Transportation, and earmarks a big chunk of change — $800 million per year by 2018 — to pay for the T, MassDOT personnel, regional transit authorities, and some big-budget construction projects. Taxes: Tax hikes on gas and tobacco— an additional 3 cents per gallon, and $1 per cigarette pack — start Wednesday. MBTA fares: No more budget-busting fare hikes. Because of the new law, the MBTA can raise ticket prices only once every two years, and can increase prices no more than 5 percent each time. Dunkin’ Donuts Station? By Jan. 1, MassDOT will have to solicit a proposal for companies interested in buying or leasing the naming rights to subway, bus, or commuter rail stations. Tolls: MassDOT has 90 days to come up with a plan to reinstitute tolls between Exits 1 and 6 on the western end of the Pike, which haven’t existed since 1996. Tolls, part two: Transportation officials must also study whether it would be feasible to establish tolls along the state’s borders. Premium parking: The T must institute a premium parking program at three high-traffic lots, where a maximum of 10 percent of parking spots will be reserved for people willing to pay a little extra for an assigned spot. Return of the Night Owl? The T must issue a request for proposals from businesses and organizations willing to sponsor late-night T service. If you’ve noticed that commuter rail trains are slightly more crowded of late, the numbers back you up: Ridership during peak commuting hours this spring rose 2.7 percent from last fall, according to data released this week by the Massachusetts Bay Commuter Railroad Co. The March number is the highest ridership count since spring of 2009. But compared with that time last year, the growth is a little more modest: It represents a .9 percent increase since the spring of 2012. 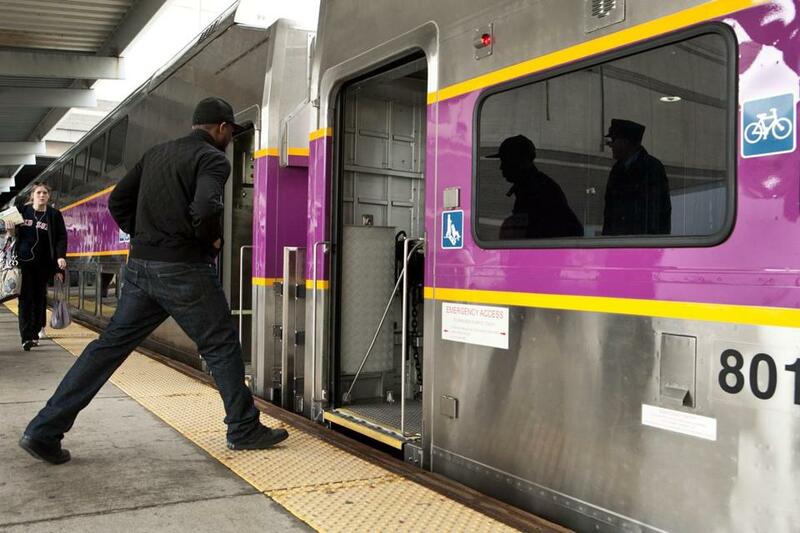 Commuter rail ridership counts are conducted twice per year, once in the fall and once in the spring, when independent counters spend two weeks tabulating the number of passengers boarding and exiting trains during peak hours at the system’s major stations. Scott Farmelant, spokesman for the commuter rail, said the growth was probably caused by improved on-time performance, as well as the expansion of weekday service to Worcester. Friday morning’s commute was a wet one for everyone in the Boston area, but few people experienced the downpour quite like Scott Fisher, who shot a YouTube video of the unfortunate leak that occurred inside an MBTA bus on Route 441 to Wonderland Station. Visualize rivulets of rainwater streaming onto the bus seats. The video’s worth a few chuckles: Check it out at Boston.com/starts. The idea, based on the Chicago Transit Authority’s U-Pass program, requires that participating colleges and universities buy unlimited-use subway and bus passes for all of their students. The passes would be discounted more deeply than the T’s current college pass program, which provides a flat 11 percent discount rate to students who opt in.